Reinforcements and the reinforcement-matrix interface; Composites with metallic matrices; Ceramic matrix composites; Polymer matrix composites; Stiffness, strength and related topics; Stiffness of unidirectional composites and laminates; Micromechanics of unidirectional composites; Strength of unidirectional composites and laminates; Short fibre composites; Fracture mechanics and toughening mechanisms; Impact resistance; Fatigue and environmental effects; Joining; Non-destructive testing. 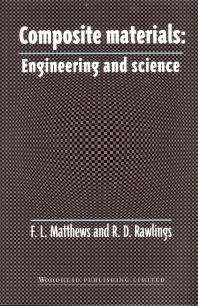 The purpose of this wide-ranging introductory text is to provide a basic understanding of the underlying science as well as the engineering applications of composite materials. It explains how composite materials, with their advantages of high strength with stiffness, together with low weight and other desirable properties are formed and discusses the nature of the different types of reinforcement and matrix – and their interaction. Methods of production, examples of typical applications and essential data are all included. Composite materials: Engineering and science is based on a successful long running course at Imperial College, London, and the numerous worked examples combined with a comprehensive set of problems and self-assessment questions (with answers) provide an excellent text for senio undergraduate and graduate courses in materials science, engineering and physics. It will also be invaluable to any designer or professional engineer new to the composite materials field. This is a reissue of a successful and well-regarded textbook originally published in 1994 by Chapman & Hall.